This jellyfish shot looks like, well – a jellyfish, is fun to make and fun to drink. Learn how to make it with only four ingredients and be the star at your next cocktail party! Jellyfish shot. The sound of that is not exactly appetizing and the images in my mind, before I actually knew what it was, were even less attractive. I know, I live under a rock and need to get out more often. But I gotta give it to the Tipsy Bartender – not only does it look cool, but it also tastes amazing too! You don’t need to measure the ingredients for the jellyfish a.k.a. Medusa shot (or does it classify as a shooter? Heck if I know). A splash of this and a drop of that is all you’ll need. One word of advice: don’t let the creaminess and yumminess of this shot fool you. It quickly goes to your head, or maybe I’m a lightweight. Oh, and cool the ingredients before mixing them. You really shouldn’t use ice or you won’t get the jellyfish effect. OK, so that’s two words of advice. My bad. In my defense, I may or may not have been drinking this jellyfish goodness while writing. I have a good reason to celebrate. My first e-cookbook is published and I can’t be more excited. Check it out here, buy it, share the news and grab a glass of your favorite drink to toast with me (considering you’re happy for me). Cheers! If you sign up for my newsletter, you’ll get my ten favorite recipes from the book for FREE. Keep the ingredients refrigerated before mixing. Fill half of a shot glass with Crème de Cacao. Top with a layer of amaretto and then Bailey’s, best pouring slowly over a teaspoon. To finish, add drops of grenadine and watch tentacles form underneath the amaretto layer. Way too cool! And now a bit about my e-cookbook. It was a long coming dream of mine. I finally decided to take a break from blogging and spend time write cook, and photograph recipes. I’m dedicating the book to two very special girls. You can see the details in a “look inside” feature Amazon offers. Please check it out (just click on the photo below) and if you like it, help me promote it. Share it with your friends, on your blog or however you like. That would mean a world to me. Thank you!!! 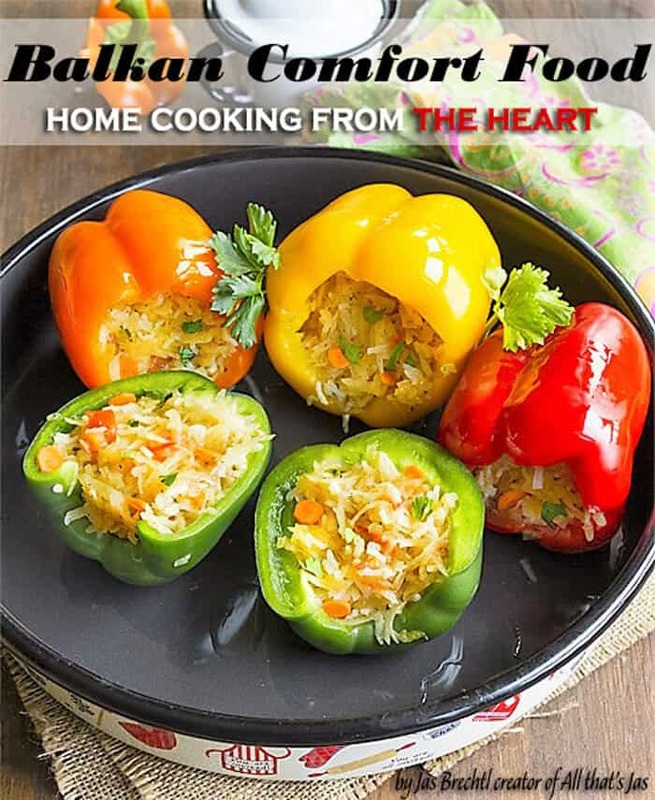 You’ll get over 50 flavorful recipes with mouthwatering photos of favorite dishes from the Balkan region. Whether you are familiar with this cuisine or not, here you will find a dish that you’ll fall in love with, guaranteed! Discover the mix of flavors from Bosnia & Herzegovina, Croatia, Slovenia, Serbia, Macedonia, Montenegro, Albania, Kosovo, Bulgaria, Greece, Romania, and European Turkey! By the way, If you like creamy, boozy shots you’ll love Cake Batter Shots. Fun and exquisite drink to celebrate with. Let those tentacles tickle your taste buds! Congratulations on your e-cookbook! Now this is one and fun interesting drink. I have never heard or seen it before so you have really caught my attention. Wishing you a super weekend! Thank you, Bobbi! The drink is super fun 🙂 Hope your weekend was amazing! First off – what a great concoction of drink! It looks beautiful (and dangerously) delicious. How could anyone resist such a drink with beautiful jellyfish tentacles? That’s very creative! Love it! You’re the best! Such an honor…thank you, my friend! Congratulations!!! How exciting…I just bought it. Your work is always so amazing. Thank you, thank you, thank you! You made my day 😀 Have a glorious week, Pamela! How cool is that Jellyfish Shot! Your link caught my eye at the Thursday Favorite Things party. Pinned to share and to definitely try this recipe. What a pretty drink! And I love all the ingredients, so I can definitely see this one being dangerous. Oh, yeah. Make it in the smallest shot glass you have 🙂 Thanks for stopping in and have a great weekend! I took a double take at the name and now have looked at this like 10 times!! Love it! Thanks for sharing with us on Throwback Thursday! Lol, I’m glad it caught your attention 😀 Thanks for stopping in and have a great day! Thank you, Raymund! Wish I could take the credit for the idea 🙂 Thanks for stopping in and have a great day! Oh my goodness that drink is so cool! How fun. I bet it’s yummy too. Thanks for sharing at the #InspirationSpotlight party. Pinned & shared. Well this is definitely the coolest shot I’ve ever seen! Pinned! Thank you, Katie! Hope your week is amazing! I’m so making this for our next guests over for dinner night!